Orgnar is the Nord barkeeper at the Sleeping Giant Inn in Riverwood. He is the somewhat sullen employee of Delphine, who owns the inn, and the two snipe at each other over business matters. When you speak to him, you may ask if he knows any leads that you could follow for work. He will then provide you with a local bounty that was recently delivered. He wears a set of lower class clothing and a pair of shoes. 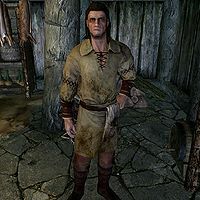 He carries common loot and gold as well as a key to the inn. He wields an iron dagger and iron mace. "We got rooms and food. Drink, too. I cook. Ain't much else to tell." "Need a room, talk to Delphine." "I'm just the cook, lad/lass." "I ain't lookin' to make friends." "You like Skeever liver. No? Tough luck." "Food's hot. Never said it was good." "There have been whispers. A boy, up in Windhelm, name of Aventus Aretino. Been trying to contact... the Dark Brotherhood." Orgnar: "Out. She owns the place, she does what she wants." Player: "So how do I rent a room?" Orgnar: "Inn's closed. Bar's still open, though. Feel free to sit and put your head down on the table for as long as you like. I won't bother you." Player: "Do you know about Delphine's... activities?" Orgnar: "That's her business. Not mine. Probably not yours either." Delphine: "Orgnar, hold down the bar for a minute, will you?" Orgnar is supposed to sell some alchemy recipes, based on the items that are added to his merchant chest. However, recipes are not in the list of items that he is allowed to trade, preventing the recipes from being available. After Alduin's Wall, Orgnar will still say to talk to Delphine for a room, even though he is now the innkeeper. This page was last modified on 9 September 2015, at 13:28.